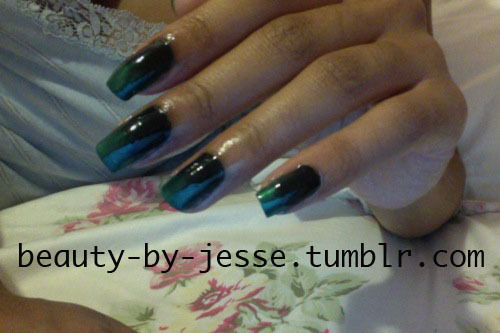 Here is my version of the ombre nail trend. Ombre is the idea of moving from one shade and gradually progressing to another. In this case, I moved from black to a deep green. In order to achieve this look, you start with the 1st shade for me it was the green. Fully coat your nails in this shade. then while it is still wet, take your 2nd color (my black) and start to paint from the cuticle. Fill in about a third of the nail. When this is done do not take more polish. Simple take the same polish brush and glide it over the black and extend it half way and stop. Once this is complete, take a clear polish and pass it over the entire nail. This will help to drag some more of the color to the rest of the nail. But leave the tips the green shade. Try it out and Enjoy! !